Quite a good rum, which unfortunately fails to carve out a distinctive Guyanese profile of its own. When one thinks of Demerara rums, Guyana and DDL immediately spring to mind. That company has so dominated the global rum scene for such rums in the past two decades that it may come as a surprise to many that it is not the sole maker of such products, nor the only inheritor to the Guyana rum moniker, and in fact, is somewhat of a late arrival. Before it was consolidated from the distilleries that were once the property of Bookers McConnell and Sandbach Parker, Banks DIH was already there, making the good stuff since the 1930s, with XM being noted as the #1 rum in British Guiana as far back as 1959. 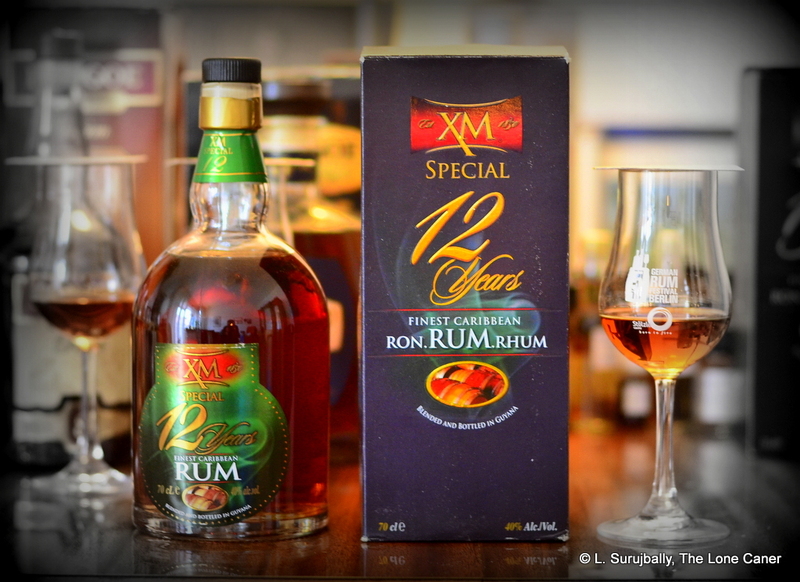 The problem for Banks (where rums are concerned) was and remains twofold: rum is actually a small part of its overall business (partly because they have no still of their own) and it also does not possess the right to use the “Demerara” appellation for its XM line – DDL fought and won a bitterly contested court case for that prize – and therefore not only is XM rum less well known, but it’s also less well marketed, and to add insult to injury, is often confused with Banks 5-island and 7-island rums from the UK. Not the best way to get your hooch to grab the brass ring now, is it? Digressions aside, the rum, now. The 12 year old — bought and tasted alongside the 10 YO and 15 YO last year — adhered to the company philosophy of making blended rum, and for better or worse, this made it present something of a generic profile…and for the reasons explained above, nothing here screamed “Guyana” in the way the El Dorado line does, which says a lot of how DDL’s (and all the other independent bottlers’) products have colonized our mental tasting map of the entire country, for good or ill.
To illustrate the point: nosing the amber 40% spirit gave up warm smells were of white toblerone, chocolate, toffee and some lemon rind. The whole aroma reminded me of a very nice dessert my son The Little Caner can’t get enough of: caramel drizzled over The Great Wall of Chocolate (don’t ask, I may lapse into diabetes on the spot). There was a faint brininess lurking behind the primary aromas, and also something musky and dark, like overripe bananas, and mangoes just about ready to turn. Moving on to taste, I felt the palate to be quite a bit better than expected, and certainly more than the nose. Normally 40% doesn’t do much for me, and here, yes that feeling of an scrawny, delicate spirit was here too…it was as thin and precise as my primary school teacher’s sharp excoriating tones (“Pay attention Mr. Caner!”) followed by the sharp snap of her two-foot long wooden ruler on my knuckles (“I warned you, Mr. Caner”). The whole initial profile was like that, very meticulously assembled, each note clear and separable from the next: bitter chocolate, salted caramel, toffee, burnt sugar; raisins, some orange peel. Then the ruler came, though not as painful – black cake, tart fruits, more raisins, molasses, blanketed by caramel and some breakfast spices. For 40% to give that much is quite something, and the finish is no slouch either – briny and dry, light all over with faint notes of cinnamon, olives, some crumbs of toblerone, with a final flirt of molasses and candied oranges. So overall, not a bad rum at all, just not one that marks its territory with verve and authority of any kind. Like I said, if you were tasting it blind you wouldn’t be sure of its origin. No anise or rich fruity notes, no pot still action, nothing that would remind you of the raw thrumming power of a PM or EHP rum at all – in fact, the XM presents as rather restrained, overall. And this is both the advantage of such a blend, and to some extent its downfall because, sorry, but the comparison is inevitable. Beyond that, if you’re not a connoisseur of specific country’s styles and just want a good drink to pour into your glass at sundown, then none of that is your concern, and this excellent mid-tier sipper will fill the bill very nicely indeed. No information on additives (sugar or otherwise) is available. For my money it has not been tampered with. The ageing regimen is unknown aside from it being done in situ in charred oak barrels which we can assume to be ex-bourbon.